Money Farm Scratch Card Guide & Review - Casino Answers! Money Farm is an online scratch card game developed by Cryptologic, featuring a 5000X top prize. You can play the Money Farm scratch and win game at VIP Casino and Casino Joy. To play the Money Farm scratch and win game, you must first place your bet. Available bets include $0.25, $0.50, $1, $2, $5, $10 or $20. Once you pick your wager, you can hit the green “Play” button to start the game. Then you can either click each door to “open” or scratch them or you can turn on “Auto Scratch” before you hit the “Play” button and the game will do it for you. The top jackpot on the Money Farm scratch lottery card game is the Horse symbol. Three Horse symbols on a scratch card will win you 5000X your bet! The next highest symbol is the Cow symbol worth 500X. If you’re looking to play a lot of games of the Money Farm lottery game with ease, there is an autoplay feature available. Below the scratch card itself you can set up to 99 autoplay spins at a time. You can cancel the Money Farm autoplay feature at any time. To play the Money Farm instant win online lottery game, visit VIP Casino and get a signup bonus of 100% up to $225 free! Are USA players able to play the Money Farm scratch card? Players based in the United States of America are not currently allowed to play at Cryptologic online casinos like VIP Casino. For a great selection of scratch card games that are US-friendly, please visit Winpalace Casino. 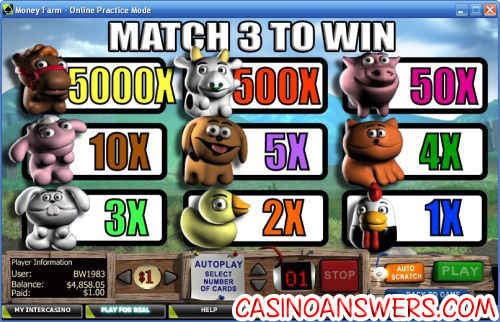 How can Macintosh casino players play the Money Farm scratchie? VIP Casino does not have downloadable casino software for Mac at this time. However, Mac users are free to use their Instant Play Flash casino. If you experience any issues with the Flash casino, please make sure you have the latest Adobe Flash Player installed on your computer. 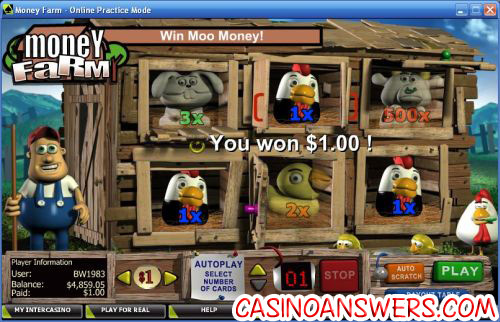 How can I play the Money Farm casino game for free? You can play Money Farm for free by using the “Practice Mode” on either the downloadable or Instant Play versions of VIP Casino. Are there any more scratch card games from Cryptologic? At the time of this writing, Crypto has one other scratch card available. For more on it, you can read our High Fashion Scratch Card Review.